Okay, I was all excited to get on here and share a new pie recipe with you…apple berry pie, actually. I wanted to tell you how absolutely scrumptious it was…moist, just a little tart, just a little sweet…how it practically melts in your mouth. Then I screwed it up and now it sits on my counter, a little too dry, a little to tart and, well…let’s just leave it at that. So, I’m moving on to the next recipe. I’ve made this one once before and it was gone in no time. My family, quite literally, inhaled it by the bowlfull. It was so good, in fact, that I’ve made it again and thought I’d share. Here’s the thing…with this Chicken Spinach and Gnocchi soup, you can go super-healthy, semi-healthy, super quick, or make it take all day. If you make everything from scratch it takes about 3 hours. That’s about what today’s batch took me, so we’ll just say it’s a great project for a rainy afternoon. However, the payoff is the most extraordinary blend of flavors in a medium thick soup that has a ton of vitamins, nutrients and other health benefits. Then, there’s the quick and easy way. It still tastes good. Just not as good. You can go with canned chicken broth and frozen gnocchi, which knocks your cooking time down to about 20 minutes and your prep time down to about 15 minutes. Either way, you still have a delicious homemade soup. Using everything listed, I made enough soup to feed 8 of us (me, my husband, two teenage boys and 2 teenage girls, as well as one of our friends and her daughter, with enough soup left over to do it again. The gnocchi recipe made enough for me to make this pot, set aside a freezer bag full of cooked balls and two freezer bags full of uncooked gnocchi. I’m freezing them both to see how well they freeze and retain their flavor and texture. I’ll be sure and let you all know the results. Start with a great chicken broth. I always make my own because it’s incredibly simple and very nutritious. Get a whole frying chicken and throw it in a pot. Then, choose what you want to go in it. 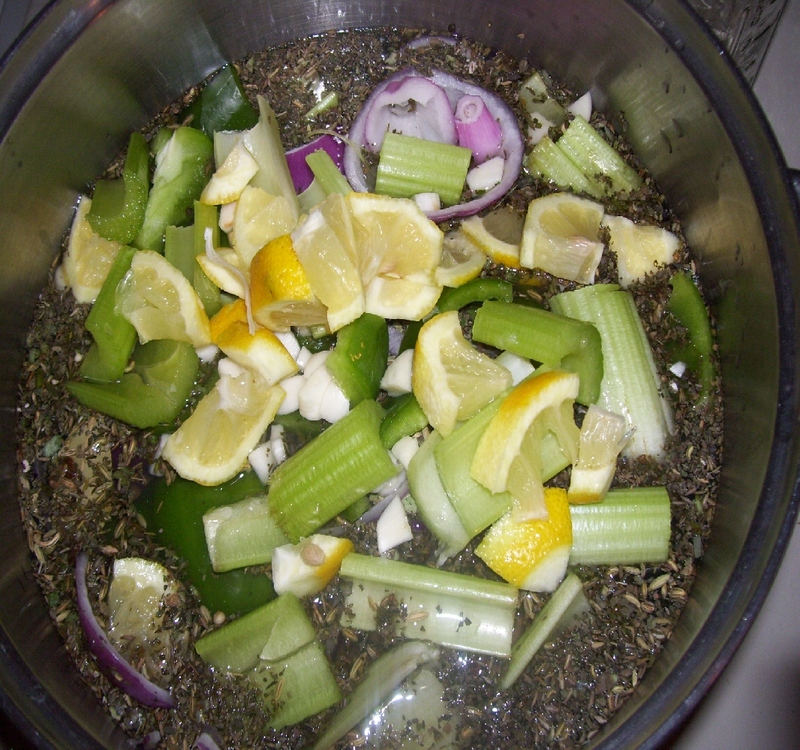 I add herbs (rosemary, thyme, oregano, lemon balm, fennel seeds and peppermint), a little salt and pepper, a few cloves of garlic, half a red onion, 4 stalks of celery and 1/2 a lemon. Add distilled water to about 1/2 inch past the top of the ingredients, put a lid on it, turn it on medium and leave it alone for about an hour, until the chicken is fully cooked but not tough. 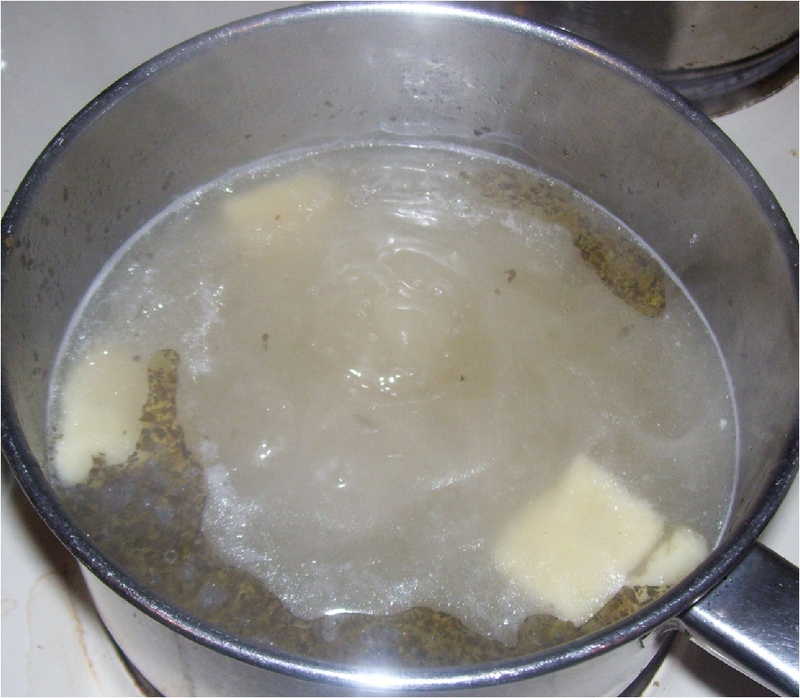 Strain off the broth into a large pot. Now, you have a delicious, healthy chicken broth. Pull the meat from the bones and chop, then set aside however much you want to add to your soup. We use about half the meat for the soup and make the other into an awesome chicken salad for sandwiches! We occasionally freeze the cooked chicken, too. It’s great to use in chicken fajitas or tacos, or to add to a soup later on when I want something quick and easy. This chicken broth totally blows away anything you can buy in a can and it gives you a very tasty, healthy, nutritious base for just about any soup, plus a full chicken’s worth of meat, so you really getting enough food here for 2 meals. Inspiringly economical of me, huh? I’ve also found that the left-over broth freezes well. I wait until it cools down, then stick it in a freezer bag and it’s ready to use whenever a recipe calls for chicken broth. I’ve stored it for up to 3 months without it losing flavor. I do have to warn you, though…when I make this in the springtime while my windows are open, I’ve had neighbors knock on my door asking what in the world I’m cooking that smells so good. More than once, we’ve ended up with unexpected (but welcome) dinner guests. It also makes your house smell totally appetizing! Next comes the gnocchi balls. Don’t know what that is? It is simply little balls made of flour, butter and potato. Boil 8 potatoes until they are soft but not mushy. I like to use the gold or red potatoes, but brown work just fine, too. When they are done, drain them (I save the water and add it to my chicken broth), peel them, then mash them up. Add 2 Tbsp of butter and enough flour to form a workable dough, usually about 2 cups. When finding the right texture, think of slightly soft and sticky Playdough. Roll the dough into long ropes and cut into 1/4″-1/2″ sections. If you are feeling particularly creative, you can kinda squish them with a fork to give them a pretty texture. I wasn’t feeling so creative today, so mine came out looking entirely ordinary. Next, bring a pot of water to a boil. I prefer to use a mixture of half distilled water, half chicken broth because it gives the gnocchi a bit of flavor. Ordinarily, they are a bit bland. 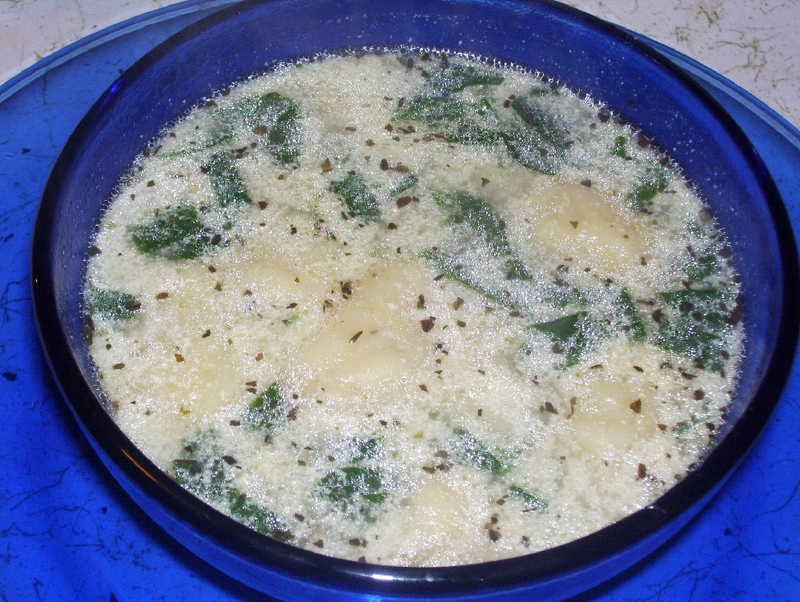 Drop in the gnocchi balls and cook until they float to the top. Drain them, then set them aside to add to your finished soup. I mix the liquid left over from cooking the gnocchi with the rest of the broth I’m using to make my soup. It makes the base a little thicker and yummier. For now, just set it aside or pitch it. Next, chop 1/2-1 red onion and 4-5 cloves of garlic. 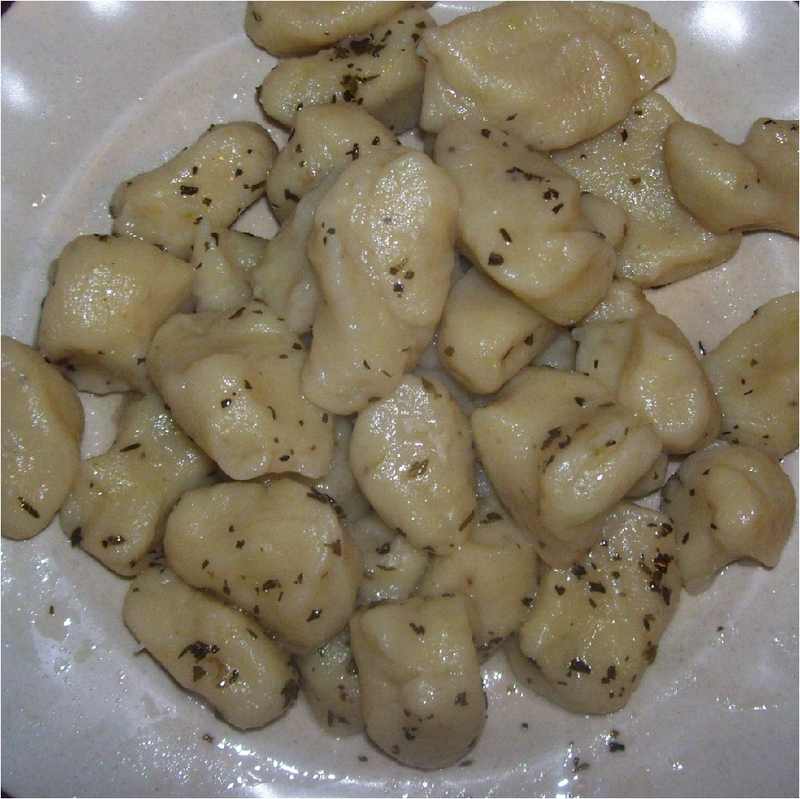 Throw them in a large skillet or pot with 2 Tbsp olive oil. Saute until the veggies are soft, then add 3-4 cups broth, 1 pint half and half and the chicken. Let simmer 15-20 minutes. Add gnocchi balls and simmer 3-5 minutes. Add fresh spinach. If you really like spinach, load the soup up. I love it this way. If you aren’t a huge spinach fan, just throw in 3/4 -1 cup. Cook until it is wilted. That’s it, folks! Here’s what you end up with. Saute onions, parsley and garlic in olive oil until soft but firm. Add Chicken broth, half and half and chicken. Simmer 15-20 minutes. Add gnocchi and simmer for 3-5 minutes. Add spinach and simmer until wilted. Cool and serve. 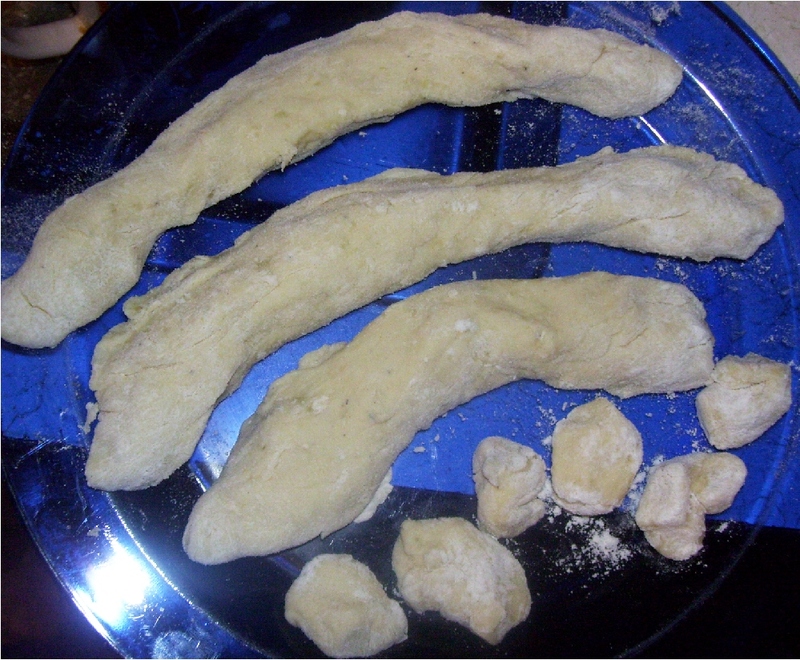 I’ll update this post later on and let you all know how the frozen gnocchi turned out. I’m hoping to have enough soup left over to try freezing. We’ll see how that goes….